There could not be a bunny girl inhabiting a library. Azusagawa Sakuta faced a scene that toppled common sense—he encountered a bunny girl, and she is nowhere a normal bunny girl. She is Sakurajima Mai, a student studying at the same school as Sakuta and a retired yet renowned actress. It was said that starting from a few days ago, those around her could no longer see her anymore, and she came to the library just to confirm this. Is this related to the hit topic on the internet, the unimaginable phenomenon known as "the puberty syndrome"? Sakuta, wanting to know the reasons behind and get closer to Mai, decided to solve the puzzle. However, the situation then developed in an unexpected way—? Note : This is my first ever review done on media that is not a video-game. I will assume you read the synopsis before you read the review. This review will not contain spoiler. Now, this is tough. If you finished reading all the chapter of this manga you still be shocked and wonder whats happening. Its not-so-unique but at the same time its not-so-mediocre. So what is it? Its actually a mix. It seems to be heavily romantic at first but slowly leaning itself to Supernatural-ish (At which point seems very similar to Monogatari). Very predictable while being very enjoyable. Alright. This is very thing that disappoint me a little bit. The main character「Azusagawa, Sakuta」is very Main-Character. What do you mean by "very Main-Character"? Its the term that I like to use describing the Main Character whom willing to help someone else just because he could or hes feeling guilty if he doesn't. Now. 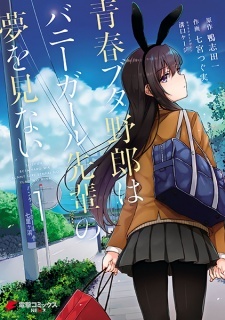 Lets talk about the bunny girl in the Bunny Girl-senpai 「Sakurajima, Mai」. At first, I understand what her character will be. An "Oujidere-Tsundere-ish", but as story progress she shown to be a very cute. There will be a moment you will think yo yourself "Aww, shes cute"
Why 10? Because it only consist of 21 chapter and did not try itself too hard to make it a 200 chapter. Story is simple but sometime it does make you go back a few chapter to understand whats going on. Both character interaction is very cute and the ending bit does make my heart moved.